The Southern Star Group is pleased to introduce TimGuard, our semi finished two coat clear seal for Canterbury Timber Windows and Doors. TimGuard is an innovative timber sealing solution exclusive to the Southern Star Group that provides superior protection to timber products. Separating TimGuard from the competition is that the system applies 2 coats in factory and 2 coats on site. This 4 coat total is often twice as much as traditional systems offer. Applying coats in a controlled private factory environment produces a higher and more consistent film build. Ultimately, TimGuard enables a 25% greater and more consistent film build and delivers a more durable and better-looking end result. 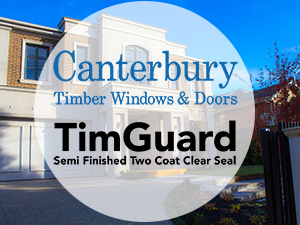 Canterbury Timber Windows and Doors with TimGuard offer superior protection during the build process. With two coats applied in factory, windows and doors are safeguarded before ever being exposed to the elements or the site. Coverage is extensive with all sides of the timber protected. Homeowners will love that TimGuard provides a longer lasting finish, less maintenance and increased protection that results in more durable windows and doors for their homes. Builders will be pleased to know that there is less preparation required as the seal is already applied and can be stained, primed and painted over. This saves both time and money. Less finish coats are required on site, which reduces time between delivery to installation and fully finished end product. Canterbury Timber TimGuard semi finished 2 coat clear seal is unique to the Southern Star Group and is the best way to ensure superior protection for your timber windows and doors. Contact us to discuss further benefits and apply TimGuard to your products.